Now that I have accumulated so much make-up, the only way to ensure that I use it regularly is to take it to work and reapply three times a day. Though the contents remain standard for the face products, I do change the lipsticks depending on what I am wearing for the day. let me introduce you to what goes with me to work everyday. The Pouch: I dislike buying pouches as I try as much as possible to recycle what I already have. 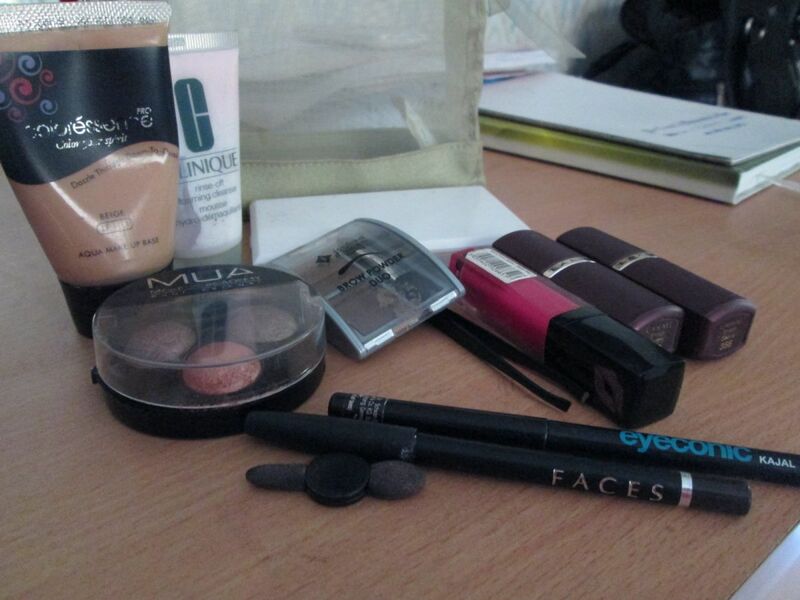 I have plenty of free pouches that I got while purchasing make up from L’oreal, Boots etc. This one is from Body Shop. I got it along with the Body Shop Nutriganics travel collection. I didn’t like the collection much but I love this pouch! It’s slim and not bulky and fits well into my bag. Foundation: Coloressence Aqua Make up base. I love thiss but I am desperately trying to finish this off so that I can move on my other foundations. It just does not get over. Eye pencils: Faces Longwear Pencil in brown and Lakme Eyeconic. I don’t really experiment with colours at work. Other Stuff (not in pic): Tweezers, Q-tip, a bot of cotton, tissue paper packet, Evion Hand Cream. I use the hand cream to remove make up when I am re-applying make -up. 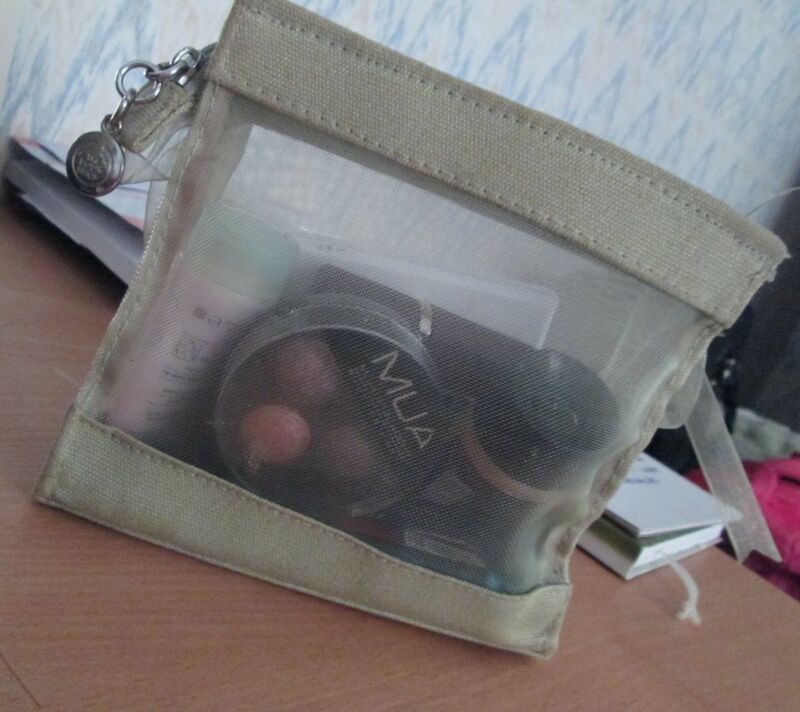 Oh I love the idea of having a pouch in your purse for makeup, I have a separate zip area but I keep loosing stuff and then I have to switch on my mobile light to see whats inside and its all like a treasure finding experience, I think I will put those ‘free’ pouches to good use. Also just stumbled along your blog today, love the name!! Pouch is a necessity. Lipsticks/ kajal etc tend to open up in the bag and create a mess if not kept aside in a pouch… Instead of a large pouch you could also use a mobile phone pouch if all you want to carry is a lipstick, concealer and 1 or 2 eye pencils.